On the jobsite, working around electricity can be very safe when workers properly identify and control hazards. But, inadequate training, lack of experience and failure to recognize potential hazards could result in electric shock or death. The construction industry is most at danger from electrical hazards, accounting for 52% of all electrical fatalities in the US workplace (US Bureau of Labor Statistics data). 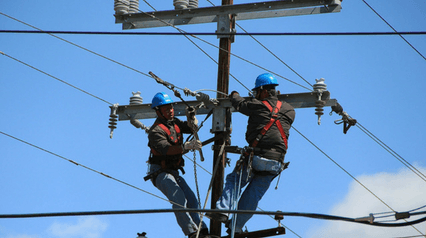 Most of these incidents and fatalities were caused by direct worker contact with overhead power lines and contact with machines, tools, and hand-carried metallic objects. So how do we protect ourselves against these dangers? This article provides a closer look at some common electrical hazards in the workplace and how to be safe around them. We also feature a collection of electrical safety checklists which you can use to assess electrical dangers on your worksite. Engineers, electricians, and overhead line workers are at the top of the list of professionals who are most exposed to electrical hazards. Common tasks that put these workers at risk include electrical installation and repairs, testing of fixtures and equipment and inspection and maintenance activities. However, people who are indirectly working with electricity like office workers are also exposed to electrical hazards. Electrical Hazards: Know Your Limits! Electrocution is one of the most common hazards across construction sites according to OSHA. Identifying electrical hazards can help raise awareness of the risks, their severity, and how it can harm workers. Here are 7 of the most common electrical hazards in the workplace and tips on what you can do to mitigate these risks. Overhead powered and energized electrical lines have high voltages which can cause major burns and electrocution to workers. Remember to maintain a minimum distance of 10 feet from overhead power lines and nearby equipment. Conduct site surveys to ensure that nothing is stored under overhead power lines. Also, safety barriers and signs must be installed to warn nearby non-electrical workers of the hazards present in the area. Exposure to damaged electrical tools and equipment can be very dangerous. Do not fix anything unless you are qualified to do so. Thoroughly check for cracks, cuts or abrasions on cables, wires and cords. In case of any defects, have them repaired or replaced. Lock Out Tag Out (LOTO) procedures should be performed at all times before commencing electrical maintenance and repairs. LOTO procedures are there to protect all workers on a worksite. Using wires with inappropriate size for the current can cause overheating and fires to occur. Use the correct wire suitable for the operation and the electrical load to work on. Use the correct extension cord designed for heavy duty use. Also, do not overload an outlet and use proper circuit breakers. Perform regular fire risk assessments to identify areas at risk of of bad wiring and circuits. Examples of exposed electrical parts include temporary lighting, open power distribution units, and detached insulation parts on electrical cords. These hazards can cause potential shocks and burns. Secure these items with proper guarding mechanisms and always check for any exposed parts to be repaired immediately. The most common OSHA electrical violation is improper grounding of equipment. Proper grounding can eliminate unwanted voltage and reduce the risk of electrocution. Never remove the metallic ground pin as it is responsible for returning unwanted voltage to the ground. Defective or inadequate insulation is a hazard. Be aware of damaged insulation and report it immediately. Turn off all power sources before replacing damaged insulation and never attempt to cover them with electrical tape. Never operate electrical equipment in wet locations. Water greatly increases the risk of electrocution especially if the equipment has damaged insulation. Have a qualified electrician inspect electrical equipment that has gotten wet before energizing it. Knowing your limits and applying best electrical safety practices can help reduce the risk of electrical shock and death. It is safer to work within your scope of expertise instead of taking the risk of working beyond your capacity. If you are not confident to do the job, don’t hesitate to call for help from an authorized person. Instead of relying on your memory, use a checklist when applying electrical safety practices in your workplace. A digital checklist is a powerful tool which can serve as a guide for performing work near electrical equipment and hazards.